Beth Hyams is a content manager for Oregon Public Broadcasting. 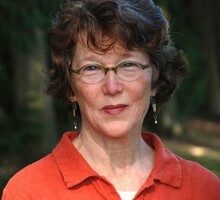 Beth has been with OPB since 1993 and has served as the station's "All Things Considered" host and newscaster for more than 20 years. Beth got her start in radio as a reporter and anchor at the community radio station KPFA in Berkeley. She was an associate producer with the public television documentarian Loni Ding in San Francisco. Before joining OPB, she was volunteer coordinator at community radio station KBOO in Portland. Beth is originally from Honolulu, Hawaii. Beth graduated from Brown University with a degree in English and American literature. A road expansion project a decade ago destroyed burial grounds and a stone altar, along with old-growth trees. Many parts of the Portland metro area are seeing a slow melt Tuesday after two frozen days. The Oregon Democratic Party won’t allow non-affiliated voters to take part in its 2018 primary. The number of Oregonians who’ve been jobless for more than six months is one-tenth the number of longterm unemployed after the Great Recession in 2010. After days of silence, President Trump tweeted Monday morning about Friday’s stabbings on a Portland light-rail train. He’s a former Bureau of Land Management employee who told other jurors “I am very biased” during their deliberations. Midfielder Jack Jewsbury said Sunday at an annual team banquet that he’ll retire at the conclusion of the 2016 season. A warm spring in the Northwest has taken a toll on the snowpack in Oregon. Snow has melted quickly, resulting in an unusual loss of snowpack. A judge ordered former refuge occupier Jason Patrick to remain in custody until his trial. The lawyers for Ammon Bundy withdrew their motion Tuesday for a second detention hearing for their client. Tazo Tea co-founder Steven Smith has died of cancer, according to his company, Steven Smith Teamaker. He was 65. Portland Police Chief Mike Reese announced today that he plans to retire from the bureau. The Fourth of July will be a bit different for residents of Vancouver, Washington, this year, at least when it comes to fireworks. About 10 and a half square miles of forest have burned just a few miles west of Bend in the Two Bulls Fires since Saturday. The body of a climber who fell on Mount Hood Tuesday morning has been located. The Oregon Legislature wrapping up its 2014 session. Lawmakers largely steered clear of hot-button social issues and instead focused on minor policy changes and adjusting state agency budgets. Gov. John Kitzhaber declared drought emergencies Friday in four southern Oregon counties. Klamath, Lake, Harney and Malheur counties are affected. For the first time, Oregon has a statewide picture of what its youngest students know. The new kindergarten assessment results released Friday show that kids' skills vary widely. After Portland police called a bomb squad about a suspicious device, the object was taken away to be examined and destroyed.